DJ is the "Data Scientist in Residence" at Greylock Partners. He has held roles at Skype, PayPal, and eBay. As was a member of the faculty at the University of Maryland, he helped start a major research initiative on numerical weather prediction. 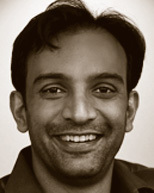 As an AAAS Science & Technology Policy Fellow for the Department of Defense, Dr. Patil directed new efforts to leverage social network analysis and the melding of computational and social sciences to anticipate emerging threats to the US. He has also co-chaired a major review of US efforts to prevent bioweapons proliferation in Central Asia and co-founded the Iraqi Virtual Science Library (IVSL).